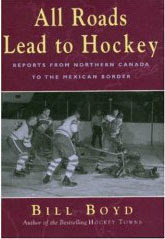 Reporting from the most northern communities of Canada all the way down to the Mexican border, journalist Bill Boyd takes a look at the state of hockey in his 2004 release All Roads Lead to Hockey . In the book Boyd profiles seven non-NHL communities, from northern Manitoba to Texas, from Michigan to Minnesota and Ontario to Virginia. It is more of a look at hockey at the interesting stories of the various grass roots levels in North America rather than glancing at the professional game. In each of the seven locations Boyd introduces us to people with a deep love for hockey who are ultimately troubled by problems that plague the sport. Boyd, obviously as disappointed in hockey's evolution as any of his subjects, talks about defensive systems, archaic coaching and the continued Americanization of Canada's game. I found Boyd's book to be more of a collection of short stories than a continuous read. While all 7 community profiles emphasize Boyd's chosen theme, somehow he never really ties it together. A concluding paragraph really, complete with a summary chapter is lacking. While Boyd convinces the reader that the game has lost much of it's old school personality, it is obvious Boyd is taking advantage of the strange fact that a large segment of hockey fans masochistically enjoy berating their own game. For the rest of us, we are left looking for whatever we can salvage from the book. There are hidden gems, depending on your interests. I particularly found the book's opening chapter in Barrie, Ontario where he relives the sad life of Real Chevrefils. Chapters devoted to the coaching exploits of John Brophy and Red Berenson also caught my attention.